American manned space station. Cancelled 1969. MOL (Manned Orbiting Laboratory) was the US Air Force's manned space project after Dynasoar was cancelled, until it in turn was cancelled in 1969. The earth orbit station used a helium-oxygen atmosphere. AKA: AFP-632;Dorian;Dorian, AFP-632, KH-10;KH-10;Manned Orbiting Laboratory. Status: Operational 1966. First Launch: 1966-11-03. Last Launch: 1966-11-03. Number: 1 . Payload: 2,700 kg (5,900 lb). Gross mass: 14,476 kg (31,914 lb). Unfuelled mass: 14,376 kg (31,693 lb). Specific impulse: 255 s. Height: 21.92 m (71.91 ft). Diameter: 3.05 m (10.00 ft). The crew rode the station to orbit and returned to earth aboard a Gemini-B capsule that was part of the station - no rendezvous or docking was required. 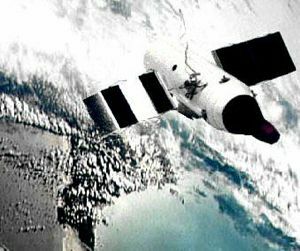 Experiments planned ranged the gamut from military reconnaissance using large optical cameras and side-looking radar, through interception and inspection of satellites, to exploring the usefulness of man in space and test of Manned Maneuvering Units. 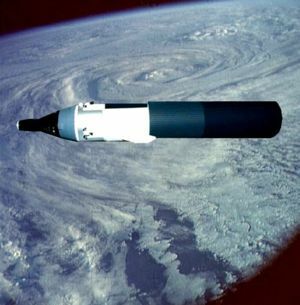 After cancellation, some of the reconnaissance systems ended up in later KH series satellites, and some of the manned experiments were accomplished on Skylab. Crew Size: 2. Orbital Storage: 40 days. Habitable Volume: 11.30 m3. Spacecraft delta v: 101 m/s (331 ft/sec). Electric System: 2,000.00 kWh. Electric System: 2.00 average kW. MOL MM American manned space station module. Cancelled 1969. The MOL Mission Module took up most of the spacecraft. It had a length of 11.24 m and was divided into two major bays, the forward section 4.42 m long, and the aft section 6.82 m long. MOL 3 At the time of the cancellation of the MOL program in June 1969, the first manned mission was planned for early 1972. A crew of two would have spent thirty days in orbit operating sophisticated military reconnaissance equipment and other experiments. MOL 4 Planned date of second manned MOL mission at time of the program cancellation. MOL 5 Planned date of third manned MOL mission at time of the program cancellation. MOL 6 Planned date of fourth manned MOL mission at time of the program cancellation. From the beginning of the project, the Navy had demanded that this be an all-Navy crew, which would limit the crew to Truly, with either Overmyer or Crippen as co-pilot. MOL 7 Planned date of fifth manned MOL mission. This mission was already deleted from the FY 1970 budget request in April 1969, two months before the entire project was cancelled. Family: Space station, Surveillance orbit, USA - Space Stations. Country: USA. 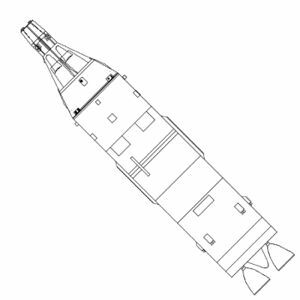 Spacecraft: Gemini B AM, Gemini B RM, MOL LM, MOL MM. Launch Vehicles: Titan, Titan II, Titan IIIC, Titan 3M. Propellants: Solid. Launch Sites: Cape Canaveral, Vandenberg, Cape Canaveral LC40. Agency: USAF, Douglas. Bibliography: 128, 137, 16, 2, 22, 26, 279, 28, 376, 54, 88. 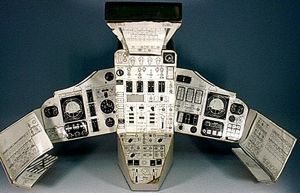 Gemini B control panel, as would be used in the MOL project, showing numerous changes from NASA Gemini. Gemini docked with MORL. 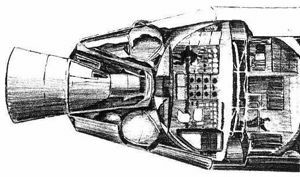 Note lack of a docking hatch in Gemini is accommodated by having docking collar as large as the base of the Gemini re-entry vehicle itself. 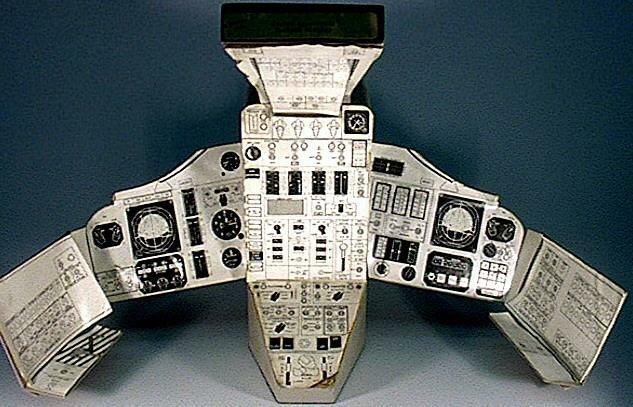 Gemini control panel - close-up of the pedestal controls between the two astronauts. 1959 June 22 - . 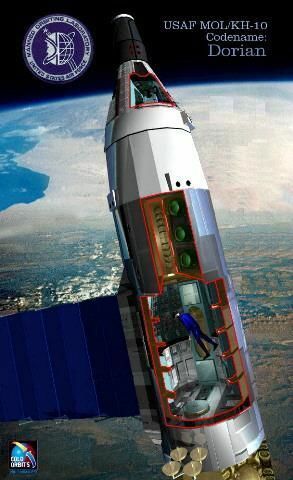 Preliminary design of a two-man space laboratory. - . Nation: USA. Spacecraft: Gemini, MOL. H. Kurt Strass of Space Task Group's Flight Systems Division (FSD) recommended the establishment of a committee to consider the preliminary design of a two-man space laboratory. 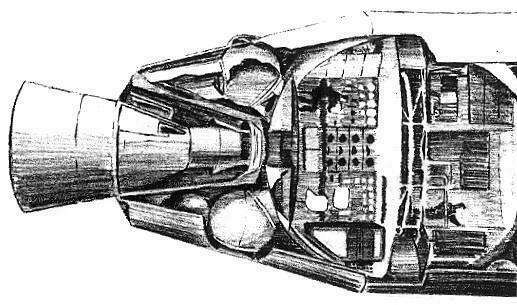 Representatives from each of the specialist groups within FSD would work with a special projects group, the work to culminate in a set of design specifications for the two-man Mercury. 1962 May 23 - . LV Family: Titan. Launch Vehicle: Titan II. Avco proposal for a space station. - . Nation: USA. Spacecraft: MOL. Representatives from Avco Manufacturing Corporation made a presentation to MSC on a proposal for a space station. Prime purpose of the station, company spokesmen said, was to determine the effects of zero-g on the crew's ability to stand reentry and thus fix the limit that man could safely remain in orbit. Avco's proposed station design comprised three separate tubes about 3 m in diameter and 6 m long, launched separately aboard Titan IIs and joined in a triangular shape in orbit. 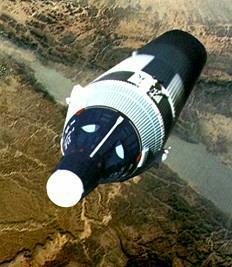 A standard Gemini spacecraft was to serve as ferry vehicle. 1963 December 10 - . LV Family: Titan. Launch Vehicle: Titan IIIM. Manned Orbiting Laboratory assigned to USAF - . Related Persons: , McNamara. Spacecraft: MOL. Secretary of Defense Robert S. McNamara assigned responsibility for the development of a near-earth Manned Orbiting Laboratory (MOL) to the Air Force. First manned flight was tentatively planned for late 1967 or early 1968. 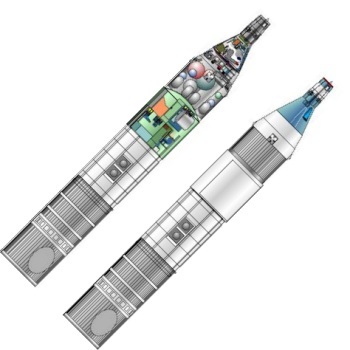 A modified Titan III, the Titan HIM, would be used to place the laboratories in orbit from Vandenberg. Military manned space effort responsibility. - . Related Persons: Schriever. Spacecraft: MOL. General Bernard A. Schriever, AFSC Commander, assigned Space Systems Division the responsibility for managing the entire military manned space effort, including the Manned Orbiting Laboratory (MOL)..
1963 December 31 - . NASA/USAF discussions on MOL joint control and support. - . Nation: USA. Related Persons: Gilruth, Mueller. Spacecraft: MOL. MSC Director Robert R. Gilruth apprised George E. Mueller, Associate Administrator for Manned Space Flight, of recent discussions with officers from the Air Force's Space Systems Division regarding MSC's joint participation in the MOL project in the area of operational control and support. Such joint cooperation might comprise two separate areas: manning requirements for the control center and staffing of actual facilities. Gilruth suggested that such joint cooperation would work to the benefit of both organizations involved. Furthermore, because a number of unidentified problems inevitably existed, he recommended the creation of a joint NASA Air Force group to study the entire question so that such uncertainties might be identified and resolved. Air Force's Manned Orbiting Laboratory and NASA's Manned Orbiting Research Laboratory studied. - . Nation: USA. Spacecraft: MOL. In the wake of the Air Force's Manned Orbiting Laboratory project and the likelihood of NASA's undertaking some type of manned orbiting research laboratory, Director of Advanced Manned Missions Studies Edward Z. Gray sought to achieve within NASA a better understanding of the utility of such projects as a base for experiments in space. Accordingly, he created three separate working groups to deal with possible experiments in three separate categories: (l) big-medical, (2) scientific, and (3) engineering. Manned Orbiting Laboratory "an ominous harbinger...". - . Nation: USA. Spacecraft: MOL. Executive agent for the Manned Orbiting Laboratory (MOL) spacecraft. - . Spacecraft: MOL. 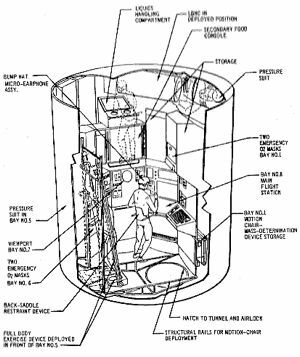 Space Systems Division was named the Air Force executive agent for the Manned Orbiting Laboratory (MOL) spacecraft..
1964 February 15 - . American space plans - . Nation: Russia. Related Persons: Bykovsky, Gagarin. Spacecraft: Almaz APOS, MOL, Soyuz PPK, Soyuz R.
Following an overview of the planned trip of Bykovsky and Gagarin to Sweden and Norway on 1-15 March, American military space plans are reviewed. There are many fantastic projects, over a wide and well-financed front. Currently reconnaissance satellites are flying, to be followed by inspection, and then anti-satellite satellites in 3 to 5 years. After that manned military space stations are planned, manoeuvrable manned spacecraft, and the establishment of scientific and military bases on the moon. 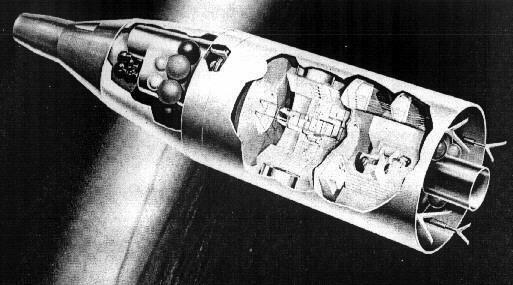 Despite this big US program, the Soviet military leadership shows no interest in Russian exploitation of space for military purposes. 1964 June 5 - . LV Family: Titan. Launch Vehicle: Titan IIIC. Three firms received authorization to begin work on space station studies. - . Nation: USA. Spacecraft: MOL. Secretary of the Air Force Eugene M. Zuckert announced that three firms, Douglas Aircraft Company, General Electric Company, and The Martin Company, had received authorization to begin work on space station studies. Zuckert predicted also that the Titan III would be test-flown that summer and would launch the Manned Orbiting Laboratory sometime in 1967 or 1968. 1965 January 23 - . Department of Defense requesting proposals for design / development of the MOL. - . Nation: USA. Related Persons: McNamara. Spacecraft: MOL. Defense Secretary Robert S. McNamara announced that the Department of Defense was requesting proposals from the aerospace industry for design studies to support development of the MOL (especially cost and technical data). Three contractors would be chosen to conduct the studies, a step preliminary to any DOD decision to proceed with full-scale development of the space laboratory. 1965 August 25 - . LV Family: Titan. Launch Vehicle: Titan IIIM. Development of Manned Orbiting Laboratory approved. - . Spacecraft: MOL. President Lyndon B. Johnson announced that he had approved the Defense Department plans for the development of a Manned Orbiting Laboratory (MOL) that would cost $1. 5 billion. The Air Force was to continue its management of the MOL program. Douglas Aircraft Company was to design and build the spacecraft that would be boosted into orbit by the Titan IIIM version of the Titan IIIC space launch vehicle. Schriever named Director of the Manned Orbiting Laboratory (MOL) Program. - . Related Persons: Schriever. Spacecraft: MOL, MOL. Secretary of the Air Force Eugene M. Zuckert named General Bernard A. F. Schriever as Director of the Manned Orbiting Laboratory (MOL) Program in addition to his duties as Commander, AFSC. Brigadier General Harry L. Evans was named Vice Director of the MOL Program. 1965 December 29 - . NASA support to the Air Force on the MOL summarized. - . Nation: USA. Spacecraft: MOL. In the initial activity report outlining MSC's support to the Air Force on the MOL, Gemini Program Manager Charles W. Mathews summarized activity to date. 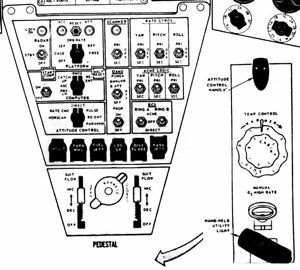 He cited receipt on 20 November 1965 of authority to transfer surplus Gemini equipment to the MOL project. Since that time, he said, MSC had delivered to the Air Force several boilerplate test vehicles and a variety of support and handling equipment. MOL program officials and astronauts had also visited Houston for technical discussions and briefings. 1966 March 12 - . Launch Site: Vandenberg. Launch Complex: Vandenberg. LV Family: Titan. Launch Vehicle: Titan IIIC. Start of construction (site preparation) for SLC-6 - . Nation: USA. Class: Manned. Type: Manned space station. Spacecraft: MOL. Start of construction (site preparation) for Space Launch Complex 6 facilities at former Sudden Ranch property..
1966 March 21 - . NASA's Apollo Applications Program should be comined the Air Force's Manned Orbiting Laboratory. - . Nation: USA. Spacecraft: Apollo X, MOL. 1966 May 20-21 - . USAF and NASA coordinate medical experiments for the Air Force's MOL project and NASA's AAP. - . Nation: USA. Spacecraft: MOL. Representatives of the Air Force and NASA met at Brooks AFB, Texas, to exchange information on medical experiments planned for the Air Force's MOL project and NASA's AAP. 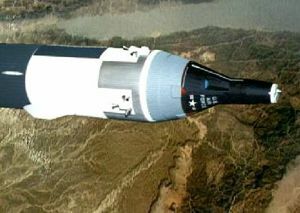 Stanley White, who headed the USAF group of aerospace medical experts, expressed strong interest in exploiting NASA's AAP project to study the effects of long-duration space flight on human life processes. White stated the Air Force's desire that MOL thus be relieved of this experiment burden so program planners could direct the program more closely toward evaluating man's utility for military space operations. The meeting furnished the basis for closer ties between the two organizations on their biomedical activities, observed NASA's Acting Director of Space Medicine, Jack Bollerud. 1966 November 3 - . 13:50 GMT - . Launch Site: Cape Canaveral. Launch Complex: Cape Canaveral LC40. LV Family: Titan. Launch Vehicle: Titan IIIC. MOL Mockup - . Payload: MOL Mockup (Titan fuel tank). Mass: 9,680 kg (21,340 lb). Nation: USA. Agency: USAF. Class: Manned. Type: Manned space station. Spacecraft: MOL. COSPAR: 1966-099xx. A Titan IIIC (Vehicle #9), the ninth research and development Titan III and sixth Titan IIIC to be launched from Cape Canaveral, completed the most difficult flight plan and most successful mission to date. 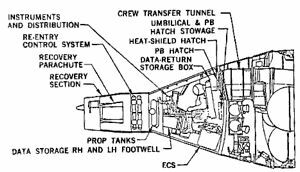 The primary objective of injecting a modified Gemini spacecraft into a suborbital trajectory to test the reentry heat shield for the Manned Orbiting Laboratory (MOL) program was accomplished. 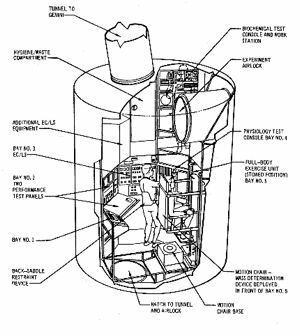 After dipping down to 80 nautical miles to eject the MOL load, the Transtage pitched up and placed a canister containing 11 experiments into a 160-nautical mile circular orbit. This modified Titan 2 propellant tank represented the MOL station itself. It allowed study of the aerodynamic loads associated with launching the MOL into orbit and validated the very long length to diameter core represented by the MOL/Titan 3M configuration. It is possible certain prototype MOL equipment was flown as well. MOL major subcontractors selected - . Nation: USA. Spacecraft: MOL. MOL major subcontractors announced by prime contractor Douglas: Republic for the waste management system; Marquardt for 45 kgf and 20 kgf orientation thrusters; IBM for computers; Garrett for ECS; Scientific Data Systems for ground support equipment..
NASA / USAF MOL Collaboration - . Nation: USA. Spacecraft: MOL. NASA agrees to fly four Deparment of Defense experiments planned for MOL on Apollo Applications mission instead (later Skylab). These included an inflatable airlock experiment. NASA also provided the Gemini 6 capsule to the Air Force for MOL crew training. MOL project delays, cost growth. - . Nation: USA. Spacecraft: MOL. Weight growth of the MOL station forced the Air Force to consider upgrading of the Titan booster. 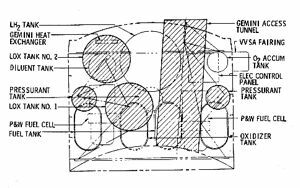 Stretching of the booster core or use of 156 inch solid rocket motors was considered. The Air Force also dithered as to whether to compete the Titan booster contract. Eight months were spent making the decision, and at the end of it all the first manned MOL flight was delayed to 1970 and the projected total cost increased from $ 1.5 billion to $ 2.2 billion. NASA briefing to Manned Orbiting Laboratory staff on fire hazards - . Nation: USA. Program: Apollo. Spacecraft: MOL. The Air Force Manned Orbiting Laboratory Systems Program Office requested that MSC present a briefing to selected office and contractor personnel on NASA's progress in safety studies and tests associated with fire hazards aboard manned space vehicles. Information was requested for the MOL program to help formulate studies and activities that would not duplicate MSC efforts. The briefing was given at MSC May 10. 1968 March 1 - . MOL qualification test underway. - . Nation: USA. Spacecraft: MOL. The MOL mockup was completed, static structural test of flight representative assemblies was underway, and major equpment was in qualification test..
1969 April 27 - . LV Family: Titan. Launch Vehicle: Titan 3M. First static test firing of Titan 3M SRB. - . Nation: USA. Spacecraft: MOL. First test firing of seven segment solid rocket booster motor for Titan 3M for MOL. The test at Coyote Canyon, California, generated 0.7 million kgf for two minutes..
1969 June 10 - . Launch Site: Vandenberg. Launch Complex: Vandenberg. LV Family: Titan. Launch Vehicle: Titan IIIC. MOL Program cancelled - . Nation: USA. Class: Manned. Type: Manned space station. Spacecraft: MOL. Deputy Secretary of Defense David Packard announced the cancellation of the Air Force's Manned Orbiting Laboratory (MOL) program because of the need to reduce defense spending. The cancellation was expected to save $ 1.5 billion of the projected total $ 3.0 billion program costs. The SLC-6 launch facility at Vandenberg, 90% complete, would be finished and mothballed. MOL reconnaisance systems useful on unmanned satellites would be completed for a total cost of $ 225 million. Ten thousand aerospace workers were laid off as a result of the cancellation. 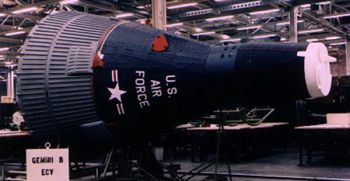 The program was initiated in 1965 to advance the development of both manned and unmanned defense-oriented space equipment and to ascertain the full extent of man's utility in space for defense purposes. Following MOL termination, NASA requested that the MOL food and diet contract with Whirlpool Corporation and the space suit development contract with Hamilton Standard Division, United Aircraft Corporation, be transferred to NASA. 1969 August 4 - . 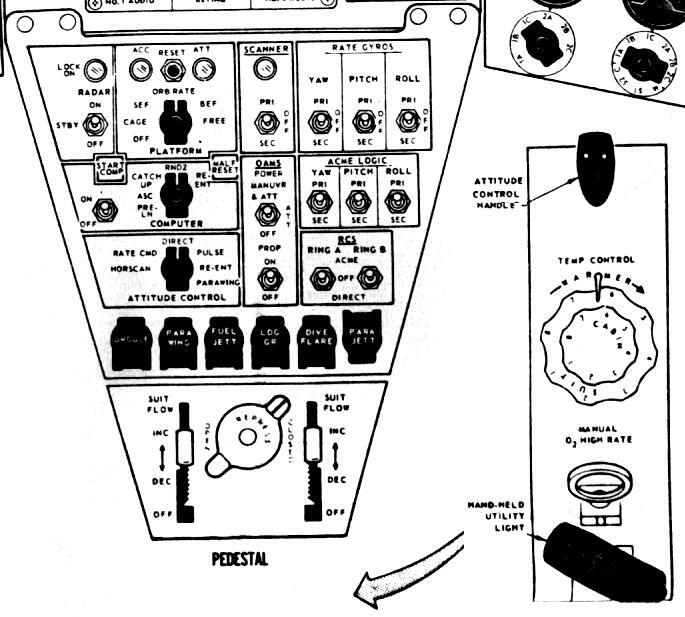 Seven astronauts from the defunct MOL project transferred to NASA - . Nation: USA. Related Persons: Mueller. Spacecraft: MOL. Acting on an offer made by the Defense Department to assign a number of astronauts from the defunct MOL project to NASA, Associate Administrator for Manned Space Flight George E. Mueller chose seven astronauts to augment MSC's flight crews. They were Karol J. Bobko, Charles G. Fullerton, Henry W. Hartsfield, and Donald H. Peterson (USAF); Richard H. Truly and Robert L. Crippin (USN); and Robert F. Overmyer (USMC). The decision to utilize these individuals, Mueller stated, derived from their extensive training and experience on the MOL project and the important national aspect of future manned space flight programs. Manned Orbiting Laboratory environment conditioning units delivered. - . Nation: USA. Spacecraft: Apollo ATM, MOL, Skylab. With the termination of the Manned Orbiting Laboratory, the Air Force provided MSFC with three environment conditioning units capable of delivering fresh air into a small enclosed space at a desired temperature and humidity. The units would be used during bench checks and troubleshooting on the ATM experiments and the related ground support equipment during storage and the preinstallation period. 1970 Late - . LV Family: Titan. Launch Vehicle: Titan 3M. MOL 1 - . Nation: USA. Spacecraft: MOL. The first unmanned Gemini-B/Titan 3M qualification flight was planned for late 1970 at the time the program was cancelled..
1971 - . LV Family: Titan. Launch Vehicle: Titan 3M. MOL 2 - . Nation: USA. Spacecraft: MOL. 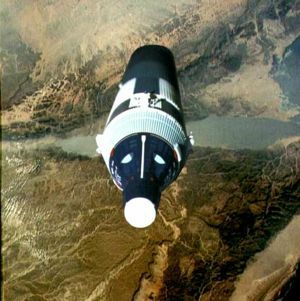 The second unmanned Gemini-B/Titan 3M qualification flight would have taken place in 1971 and set the stage for the first manned mission in 1971..
1972 Late - . LV Family: Titan. Launch Vehicle: Titan 3M. MOL 4 (cancelled) - . Nation: USA. Flight: MOL 4. Spacecraft: MOL. Planned date of second manned MOL mission at time of the program cancellation..
1973 - . LV Family: Titan. Launch Vehicle: Titan 3M. MOL 5 (cancelled) - . Nation: USA. Flight: MOL 5. Spacecraft: MOL. Planned date of third manned MOL mission at time of the program cancellation..
1975 - . LV Family: Titan. Launch Vehicle: Titan 3M. MOL 7 (cancelled) - . Nation: USA. Flight: MOL 7. Spacecraft: MOL. Planned date of fifth manned MOL mission. This mission was already deleted from the FY 1970 budget request in April 1969, two months before the entire project was cancelled..